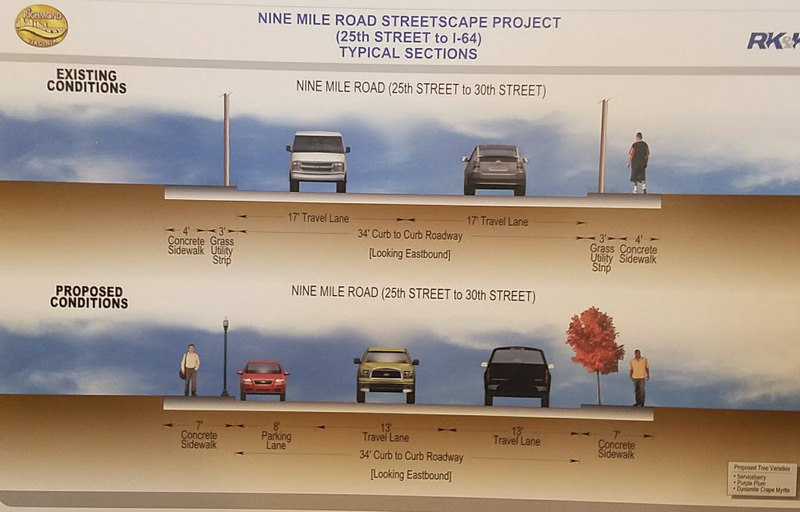 The City of Richmond wants YOUR input on the Nine Mile Road Streetscape Project. Let’s start with the Nine Mile Road Streetscape Project. We’ll publish the 29th Bike Walk Survey on Friday 4/6. Purpose: This urban corridor is in needs of streetscape revitalizations to improve safety, accessibility, mobility and access management. History/Timeline: The City commissioned an East End Transformation Study in 2010 that recommended various improvements along the Nine Mile Road corridor. Preliminary design began in late 2017. Construction proposed in 2018-2019. 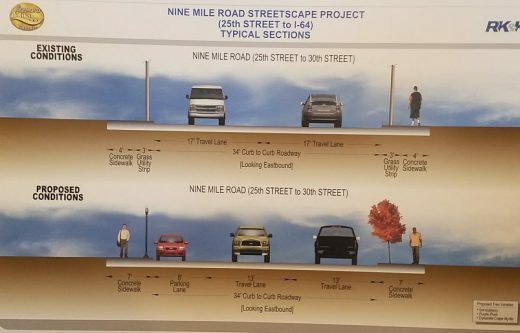 Scope of Work: Streetscape and revitalization amenities on Nine Mile Road from 25th Street to I-64 including sidewalks, entrance repairs, curb ramps, crosswalks, street trees, pedestrian street lighting, and corner extensions. As you can see there are some critical things that caught the attention of some of the people who attended. The main complaint is the existence of the “travel lanes” which by many accounts are not safe. We’re meeting with the Bike Walk RVA team this week to discuss this, so keep an eye out for that article! Look, I want N Church Hill to be pleasant. But more importantly I’m tired of my packages getting stolen (and no, I can’t ship them to my workplace). I have a camera, it’s homeless/disheveled looking people I would bet on walking down from N. Church Hill. Quite honestly, the less pedestrian accessible the northern area is to the southern area, the better for crime. I’ve also had a lawn mower and bike stolen out of my backyard, probably headed for the pawn shop or metal recycling places. 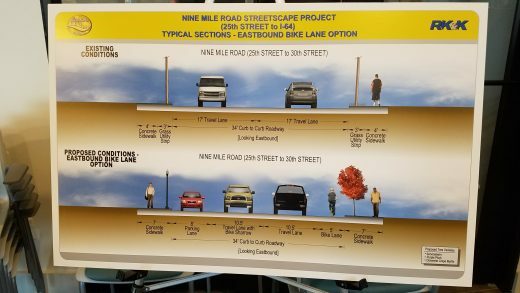 why would they even consider an option without bike lanes? Not sure if others are experiencing this, but I’m having trouble with the survey link…. Drizzle, great thoughts. Sounds like we should build a wall. Always great to see someone (anonymously) come out and advocate for keeping poor people in WORSE conditions, so they can continue to live their lives separately without having to be confronted with inequality! Keep sidewalks and bike lanes out of poor neighborhoods so this man can order things from Amazon! Lol… I don’t want my packages stolen, and somehow I’m the jerk. Yet keeping people FROM having sidewalks solves your package problem? “Somehow I’m the jerk” you literally implied correlation between the spread of crime with the improvement of infrastructure in poorer neighborhood, and that you’re more concerned with the status of your belongings than with the well-being of others who are worse off? So yeah, you are a massive jerk, to say the least. You want to prevent it by not developing sidewalks! That was YOUR statement! A numbskull, ignorant statement that would do nothing to affect your precious packages! I’m really not sure how you’re not seeing how absurd your response was to this article. As someone else said before my response, do you want a wall between portions of the neighborhood? Move to a different neighborhood. Sell the project’s lands to private developers to generate tax revenue for the City. Time to take down the monuments to the past. I don’t live in Richmond, but my father’s people did for decades on Fulton Hill, and most of them are buried in Oakwood Cemetery. The Nine Mile entrance to the Cemetery is the main way I access my parents’ graves and those of my grandparents, aunts, cousins, etc. Every time I drive by, I see Creighton Court. 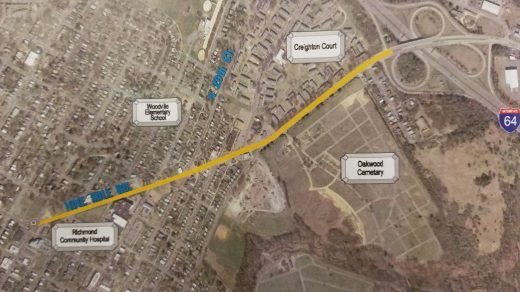 ANYTHING that helps the Court get improvements for transportation, safety, access, appearance, whatever the residents want, I am totally behind. They deserve better than what they have now. PS: Richmond is so fortunate to have cemeteries be public land. It’s a relief to me that so many of my family members are in a place that isn’t dependent on the whims of a private company. Would that Evergreen was the same. It seems every immigrant from the west cost or north east think bike lanes are Virginians priorities . They want to blacktop everything . I get sidewalks. Too many streets lack them in the city. But where are residents walking? There are too few amenities in this part of the city to warrant this kind of project. Build the services before worrying about servicing them, or spend the money on schools. 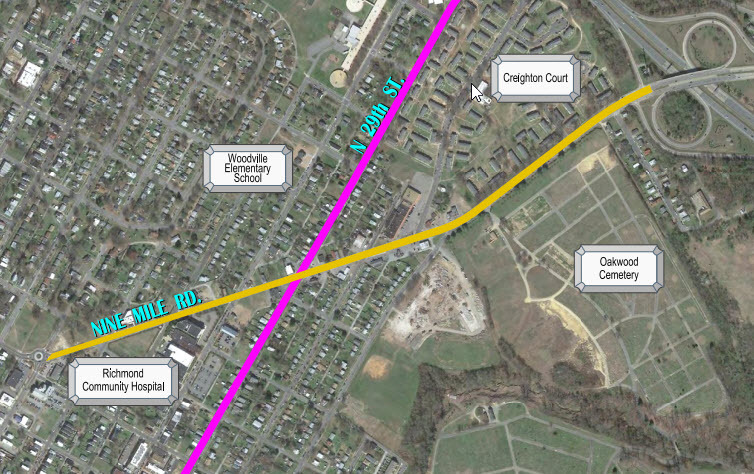 I hope DPW is making sure the residents of the 9 mile corridor are gaining access and providing input. Would hate to see the same issues that GRTC Rapid Transit had: the people who never use it surveyed at the expense of residents who depend on it. Immigrants from the west coast? What are you talking about?, a few people on this website are so ridiculously narrow-minded and prejudiced. Every article always has a couple of comments that show blatant self centered focus and zero consideration for others. I feel embarrassed for you. Between you and drizzle, you should start a gated community with the “right people” (no immigrants), checking how many generations in their family have lived in Richmond, but of course, making sure poor people have no access because they might steal your Amazon spatulas. Maybe buy an island somewhere, because as said above, we sure don’t want you here. Why is this needed; don’t we have far greater priorities than walkways and bike ways on an already quiet street? As I see it in it’s current condition, 29th is already very pedestrian/bike friendly. No bike lanes or any other upgrades to any city roads for reasons other than urgent and immediate safety problems until maintenance of existing roads and alleyways is fully funded. Building new stuff when we can’t even maintain what we have is a total waste of money. Driving on many city streets and alleys is currently like driving on a crater-filled hellscape. Fix what you have before you take on even more projects that face a future of unfunded maintenance and neglect. Not the Richmond way unfortunately ? I agree with Mr. Feinstein. The Mayor claimed the city filled thousands of pot holes last year but if they did they filled them with defective asphalt since they now seem worse than they have ever been. What a friggin’joke.